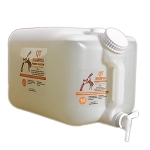 QT™ Gold Foaming Solution QT™ No Scrubbing, No Mess. Simply spray on and rinse off. One of the fastest and easiest products you'll ever find! PH balanced to help stop skin dis-orders before they begin. 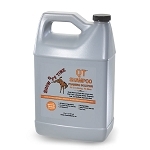 Formulated from plant esters, it attracts soils, fats, and proteins attached to the coat, mane and tail. All natural, non-toxic, biodegradable shampoo with conditioners. Helps prevent girth itch. 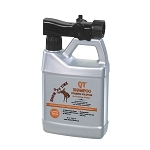 Recommended for short haired animals.